We’d love your help. Let us know what’s wrong with this preview of Catechism of the Catholic Church by John Paul II. Here it is -- the first new Catechism of the Catholic Church in more than 400 years, a complete summary of what Catholic throughout the world believe in common. This book is the catechism (the word means "instruction") that will serve as the standarad for all future catechisms. The Catechism draws on the Bible, the Mass, the Sacraments, Church tradition and teaching, and th Here it is -- the first new Catechism of the Catholic Church in more than 400 years, a complete summary of what Catholic throughout the world believe in common. This book is the catechism (the word means "instruction") that will serve as the standarad for all future catechisms. To ask other readers questions about Catechism of the Catholic Church, please sign up. Does anyone know of an audible version of this? The only audible version I can find is the US Bishop's Catechism for Adults. Geez...it actually makes sense. I think I'm a closet Catholic. December 22, 2017: This was my third full time to read the Catechism all the way through, though I have read many parts of it piecemeal. This time I read it using an online service which you can subscribe to here. I highly recommend it as a painless way to read though the CCC in a year. You only receive emails during the week; two days off for week-ends. Even if you get behind you can catch-up later just by saving the email notifications. They also offer a similar service to learn the Popes in a year. The papal information often verged on the silly to me, but I suppose that was to lighten the serious subject nature. I found it irksome. The Catechism material is presented in a straightforward manner, no silliness. It is not in lieu of reading the actual Catechism, however. It is just a question and answer about a section of the material. Then you are encouraged to go to the actual text and read more. Effective way to study this important document for all Catholics. The Catechism of the Catholic Church (CCC) is probably the most difficult book I’ve ever attempted to review—and also one which matters more to me than all the rest. As such, I can’t write about it like some dry theological tome which the vast majority couldn’t understand and the rest wouldn’t bother with even though they could. Experience with using the CCC has taught me that it’s anything but a dusty religious relic. For years I approached the Catechism tentatively and with trepidation, as though it would be much too difficult for the average Catholic (such as myself) to understand, failing to appreciate as most people do that the average Catholic is precisely who the book is written for and to. It's easy to use, well-organized, fully-indexed, cross-referenced throughout, and footnoted with thousands upon thousands of quotes, especially from Holy Scripture, but also the early Church Fathers and saints. If you don’t have a copy, it’s available on-line here and here. The advantage of the on-line versions are the almost infinite number of links! Catholic geek heaven. I marked this as ‘read’ but I wish GR had a category for constantly-reading. EVERYTHING you always wanted to know about the Catholic Church but never bothered to ask. December 12, 2013, Feast of Our Lady of Guadalupe: FINISHED IT! And much sooner than I expected to. My review is going to take a little while however as I want to go back over my highlights and margin notes before writing anything. So glad I read it! Nov 23, 2013 Update: Just starting into 3rd Pillar, 'Life in Christ'- Christian Morality, and discovering it to be even better than first two pillars, so it keeps getting better ... and I already know the 4th part (Prayer) is my favorite. Oct 26, 2013 Update: Have finished the first 5 Parts in "The Pilgrimage of Faith" study and they are excellent, but the Catechism itself is the real treasure. Didn't realize how much was here nor how much I was missing out on by not reading before now. I can still remember the day I was walking in the mall and saw this featured in a Waldenbook display. Why was I so surprised to see a 'catechism' in among the bestsellers? Little did I know then the long arduous process this book had to undergo to make its way to that bookstore. My other thought was, "Vatican II ended in 1965. This is the 1990's. Why has it taken almost thirty years to publish a new catechism?" Why indeed?! For every Catholic and for anyone who has honest questions about Catholicism. "Why the rosary?...Why Mary...Why communion?...etcetera." This book has direct Biblical reference (by Chapter and verse) to every question that could be possible asked of Catholics. A great resource for Apologetic discussions. going to finish it this year in the Year of FAith!! In a former life I used to believe that the Catechism was a collection of rules imposed on believers. At that time I only understood a quarter of the Church's teachings and disagreed with another quarter (. While I still have much theological ignorance, I would be hardpressed to find a passage in the Catechism with which I now disagree. This is not because I have surrendered my intellect to the dictates of an authoritarian Church. Rather, I have come to believe that the teachings contained in th In a former life I used to believe that the Catechism was a collection of rules imposed on believers. At that time I only understood a quarter of the Church's teachings and disagreed with another quarter (. While I still have much theological ignorance, I would be hardpressed to find a passage in the Catechism with which I now disagree. This is not because I have surrendered my intellect to the dictates of an authoritarian Church. Rather, I have come to believe that the teachings contained in the Catechism form a beautiful description of reality. Every Catholic (and probably most Christians) should own a Catechism and consult it regularly. It is not meant to be read from cover to cover, but to be an indispensible guide on important matters. With all the misinformation floating around in the heads of Catholics and non-Catholics alike, the Catechism can be a refuge for those wanting to know what the Church actually teaches. I have never actually read through the entire Catechism. The Catechism is often thought of as the Catholic "rule book" and that is true in a way because a catechism is a summary of Catholic belief. However, it is not couched as we would normally think of a "rule book." The Catechism flows through four big ideas: The Profession of Faith, The Celebration of the Christian Mystery, Life in Christ, and Christian Prayer. There is a good explanatory article here by Mary DeTurris Poust who wrote The Idi I have never actually read through the entire Catechism. The Catechism is often thought of as the Catholic "rule book" and that is true in a way because a catechism is a summary of Catholic belief. However, it is not couched as we would normally think of a "rule book." The Catechism flows through four big ideas: The Profession of Faith, The Celebration of the Christian Mystery, Life in Christ, and Christian Prayer. There is a good explanatory article here by Mary DeTurris Poust who wrote The Idiot's Guide to the Catechism, which I can also recommend (and need to remember to review on Goodreads, now that I think of it). At any rate, it is worded in a way that definitely promotes deeper thought, prayer, and reflection although I have used it more as a reference than anything else. Pope Benedict XVI is encouraging us to read and reflect upon the Catechism during the year of faith which began today. Oct. 11, 2012. So that brought it to mind. And there is a neat service which will deliver a little per day in email ... so it is pre-portioned so to speak. It really upsets me that most Catholics haven't read this. Totally shameless. Read it people!! You never know, you just might learn something. Yes, as a baptist I read the Catholic catechism. I wanted to read what the Catholic church said rather than get it from others. There are some portions that are very, very good. The section on the Apostle's Creed, Life in Christ, and the section are prayer. Of course, there are things that I disagree with, but I can also say that many things I have been told Catholics believe did not come through in their catechism. The trouble with reading a book like this one is that it will sabotage all the preconceptions you have so carefully formed over the years about what Catholics really believe. This was an encouraging and often edifying read. That said, I have many fundamental disagreements with the Roman Catholic church. However, not as many as I thought I possessed! 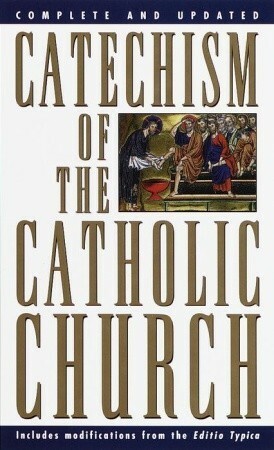 I would strongly suggest that you read this along with the official documents of Vatican II so that you can see in full the official dogma of Catholic The trouble with reading a book like this one is that it will sabotage all the preconceptions you have so carefully formed over the years about what Catholics really believe. This was an encouraging and often edifying read. I would strongly suggest that you read this along with the official documents of Vatican II so that you can see in full the official dogma of Catholicism when the Catechism references the Sacrosanctum Concilium, the Dei Verbum, the Lumen Gentium, or the Gaudium et Spes. Another excellent companion resource to the Catechism would be Peter Kreeft's Catholic Christianity: A Complete Catechism of Catholic Beliefs Based on the Catechism of the Catholic Church. Essential reading for any Catholic... Helps so many things to click and make sense. A good resource for any Catholic bookshelf. One that you can go back to over and over for any questions that may arise or ongoing faith formation. This catechism is not "user-friendly" in any way. I find it very confusing, and as someone else has noted, far too wordy. A must read for all Catholics. E finito! I am so proud of myself. I did it! Take that Baltimore Catechism, take that! OK, I must admit I am still going to randomly blabber Baltimore Cathecism answers because I still dig them. So what do I think about the Catechism of the Catholic Church? 1) The Creed, which was written at the Council of Jerusalem in 50 AD. Any Christian should know it by heart, "We believe in God ..." But few Christians fully understand what they are professing. Part one reaffirms the intention that has not changed for two thousand years. 2) The Sacraments a So what do I think about the Catechism of the Catholic Church? 2) The Sacraments are what Christians hold sacred: the three sacraments of initiation, the two sacraments of healing, and the two sacraments of service, which are Holy Orders and Matrimony. Catholics and non-Catholics alike should read the service part to better understand the Christian political point of view for the society they serve. 3) The Body of Christ reaffirms the Judaic belief that every human being is created in the image and likeness of God. The US Constitution is based on this ethic and morality. 4) Christian Prayer is the human communication with God. The story of Adam and Eve speaks to an age old need for humanity to be in a personal loving relationship with creation and the Creator. This is a wonderful volume. It has been criticized for being dry and overly verbose, and then defended by its encyclopedic nature. But I don't find it to be all that dry, and actually read the entire thing over the course of a year and quite enjoyed doing so. It's a great reference. I have both the small white hardcover edition, which makes for easy reading, and the large green edition, which is unwieldy but has a great index along with other supplements. A must-have for any Catholic home. I think I have to give it a 5 star because I'm Catholic and I'd have to go to confession if I didn't. This book is NOT Catholic. It is totally evil; for it purports to be authoritative and definitive about the doctrines of the Catholic Church when the truth is just the opposite. It doesn't deserve even 1 star but there was no lower rating I could give. It is filled with heresy and apostasy which is no surprise because John Paul 2 was not a true pope but a manifest heretic and an apostate antipope. There have been over 40 antipopes in Church history. John 23, Paul 6, John Paul 1, John Paul 2, Ben This book is NOT Catholic. It is totally evil; for it purports to be authoritative and definitive about the doctrines of the Catholic Church when the truth is just the opposite. It doesn't deserve even 1 star but there was no lower rating I could give. It is filled with heresy and apostasy which is no surprise because John Paul 2 was not a true pope but a manifest heretic and an apostate antipope. There have been over 40 antipopes in Church history. John 23, Paul 6, John Paul 1, John Paul 2, Benedict 16, and Francis have proven to be heretics over and over and over and over again. The proof is undeniable. Some of the heresies this book teaches are that non-catholics can receive "Communion", that the old covenant is still "valid" and the jews should not be looked upon as rejected by God, which is directly contrary to what was infallibly declared in the Council of Florence confirmed by Pope Eugene IV which states that all those who reject the teachings about Our Lord are rejected by God and the Church. The "catechism" of Jp2 teaches that man is "God", and it denies the fact that people are not born "gay". The truth is that homosexuality is unnatural and is a result of sins of impurity, idolatry, and apostasy. Romans 1- “Because that, when they knew God, they have not glorified him as God, or given thanks; but became vain in their thoughts, and their foolish heart was darkened... who changed the truth of God into a lie; and worshipped and served the creature rather than the Creator, who is blessed for ever. Amen. For this cause God delivered them up to shameful affections. For their women have changed the natural use into that use which is against nature. And, in like manner, the men also, leaving the natural use of the women, have burned in their lusts one towards another, men with men working that which is filthy, and receiving in themselves the recompense which was due to their error.."
The truth is that people can be cured of any unnatural vice if they convert to the Traditional Catholic faith, pray the 15 decade Rosary every day, and make a good confession of all their mortal sins. See this file for more information of this truth that people are not born "gay". It is a truly charitable thing to tell people who claim to be "gay" the truth that will set them free. What is not charitable is to confirm them in their sin and encourage them in a lie that will ultimately lead to their eternal ruin. The truth is that there has not been a true pope reigning in Rome since the death of Pope Pius XII who died in 1958. The fact that the city of Rome would lose the Catholic faith at the end of the world and leave the Catholic Church through apostasy is prophesied in the book of Apocalypse/Rev., by the Blessed Virgin Mary, and by past true Popes. We are now living through the great apostasy that was predicted to take place in the last days. Christ says that “But yet the Son of man, when he cometh, shall he find, think you, faith on earth?” –Luke 18:8. He also says, “For there shall arise false Christs and false prophets, and shall shew great signs and wonders, insomuch as to deceive (if possible) even the elect.”-Matthew 24:24. What a person must understand is that the Catholic Church cannot defect. It cannot teach error to souls for it is the Immaculate Bride of Christ always faithful to His Doctrine until the end of time. The Catholic Church is the one true Church of Jesus Christ and He founded it upon St. Peter. The Whore of Babylon is NOT the Catholic Church. The Whore of Babylon is in actuality the counterfeit-“Catholic Church” that takes over the Vatican in last days. The Whore is a false sect where a false “hierarchy” dress exteriorly like the Catholic Church, but inwardly is fraudulent, headed by antipopes, and devoid of the Apostolic faith. The mission of these antipopes is clear, it is to try and destroy the Catholic faith—which is impossible—to try and deceive people claiming to be Catholics into accepting the false religion these antipopes promote. The whore of Babylon seeks to be in communion with every false religion of the devil. She spews heresy and apostasy daily and loves to spread religious indifferentism, satanic syncretism, that man is “God”, that people can be saved in false religions, etc. Those wicked false doctrines are solemnly condemned by the true Popes as heresy and apostasy that places anyone who accepts those heresies obstinately as outside the Catholic Church. There are more misconceptions or misunderstanding of the teachings of the Church Christ left us to hand on the faith. This book is a gift to anyone wanted to understand what the actual teachings are on almost any topic and what the foundational sources are for those teachings. Great and readable resource for any Catholic or anyone interested in what it is the Church actually teachings and why. I hardly know where to start. Parts of this book have the potential for much good in the world. the actual Church that comes out of this document, or from which this document comes, depending on your point of view, is so morally bankrupt that one imagines they have had no exposure to the message of Jesus. Much of Christianity falls out based on the writings of Paul, the most successful, long term productive spy of all time. Sent as a Roman spy to destroy the church of Christ from within, he kind I hardly know where to start. Parts of this book have the potential for much good in the world. the actual Church that comes out of this document, or from which this document comes, depending on your point of view, is so morally bankrupt that one imagines they have had no exposure to the message of Jesus. Much of Christianity falls out based on the writings of Paul, the most successful, long term productive spy of all time. Sent as a Roman spy to destroy the church of Christ from within, he kind of steals leadership out from under the folks who Knew Jesus, declaring, and then making himself, and his words more import, historically, than those of any other biblical writer almost completely excluding Jesus' words. The organization of the book makes it nearly impossible to follow a thought inside one chapter, much less connect it to another chapter. And written by men with their heads so deeply into their own importance that you can't believe much they say. never noting that all the religious groups based on Christianity lock onto Paul with all their fangs and claws, ignoring the quiet voice of Jesus to "love one another", to practice what Jesus preaches. Somehow I doubt that Jesus had in mind an annual washing of the feet of the largest donors to the parish annually when he said "As I have done, so you must do," to the disciples, having washed their feet. I have to stop now, this is too much evil to look at for very long, and I daresay the confused ramblings of this review are at least a match for the confused ramblings of the assorted people who built this book. It makes me crazy, so much evil masquerading as so much good, being filthy rich and bemoaning the fate of the poor. Sell a few rings and feed a small nation, Pope Ben! What inspired me to read this book was another book. C.S. Lewis' Screwtape Letters. The book opened my eyes to just how easily one can be led astray, no matter how Christian we believe ourselves to be. All of us slip, it's what we do, and the majority of us don't catch ourselves at it. I started reading this, because I truly want to answer these questions: What does it mean to be Catholic? If you do not follow the Vatican, are you still Catholic, even if you do live by the Apostle's Creed and th What inspired me to read this book was another book. C.S. Lewis' Screwtape Letters. The book opened my eyes to just how easily one can be led astray, no matter how Christian we believe ourselves to be. All of us slip, it's what we do, and the majority of us don't catch ourselves at it. I started reading this, because I truly want to answer these questions: What does it mean to be Catholic? If you do not follow the Vatican, are you still Catholic, even if you do live by the Apostle's Creed and the 10 Commandments? It's funny how there are so many versions of the Catechism of the Catholic Church when I did a search on GRds. There's one by the Vatican, and then there's another one by the U.S. Catholic Church...why are there 2 separate versions for the same faith? Why is there a version exclusively for the US? Unless I'm mistaken, American English is, on paper, exactly the same as British English. Or is the U.S. Catholic Church different in some way from the other Catholic churches around the world? This would directly contradict the word Catholic, which means universal. Perhaps the U.S. Catholic Church is following their own rules, and maybe this is the reason why many American Catholics have grown to reject the faith? I've looked online, and apparently, the American Catholic Church s a small Independent Catholic denomination originating from the Old Catholic Christian denomination. The ACCUS holds similar theological beliefs and practices to the Roman Catholic Church. However, like Orthodox churches, it is not in communion with the Roman Catholic Church or under Papal jurisdiction. So I was right! It is different from the Old Catholic church, and they ARE following their own rules. The real review will be written after I finish, perhaps some time next year. Not even Catholic, but never have I read a more comprehensive book on the Christian faith. I started it almost a year and a half ago, but from what I remember earlier parts of it were often dense. Push through these bits! It’s worth the effort, and the going does get easier. Want to know what Catholics believe? Read the Catechism. And if you have any trouble understanding anything stated, simply look up and read the references. For "The Year of Faith", Sarah and I read 7 paragraphs per day. What a treasure this book is! Yet another important legacy left by our beloved JP2. Started this as spiritual reading thanks to a recommendation from the Happy Catholic. The early part makes me want to read the bible more, for as St. Jerome says, "He who is ignorant of Scriptures is ignorant of Christ." Finally finished it. It is not the best book to read straight through. It is well organized but a little dry. Not completely dry, though. Many quotes from saints writings (including biographies like Augustine's Confession and St. Teresa's Story of a Soul) are used to illust Started this as spiritual reading thanks to a recommendation from the Happy Catholic. The early part makes me want to read the bible more, for as St. Jerome says, "He who is ignorant of Scriptures is ignorant of Christ." Finally finished it. It is not the best book to read straight through. It is well organized but a little dry. Not completely dry, though. Many quotes from saints writings (including biographies like Augustine's Confession and St. Teresa's Story of a Soul) are used to illustrate or illuminate what's presented. Such quotes gave me a reassuring sense of history and humanity. The sheer number of sources is impressive as is the historical breadth of them. No century of the past 20 seems neglected or overemphasized. The unity of faith throughout the ages is awe inspiring. That being said, as a comprehensive presentation of the doctrines and life of the Catholic Church, it is necessary to be brief and to the point. The Catechism is a great resource thanks to the thorough indexing and cross referencing. If you have a question or are interested in a specific topic, it is easy to find the information you want. The book is written with paragraph numbers, so citations refer to those numbers rather than page numbers. 819 "Furthermore, many elements of sanctification and of truth"273 are found outside the visible confines of the Catholic Church: "the written Word of God; the life of grace; faith, hope, and charity, with the other interior gifts of the Holy Spirit, as well as visible elements. "274 Christ's Spirit uses these Churches and ecclesial communities as means of salvation, whose power derives from the fullness of grace and truth that Christ has entrusted to the Catholic Church. All these blessings come from Christ and lead to him,275 and are in themselves calls to "Catholic unity." That false opinion which considers all religions to be more or less good and praiseworthy, since they all in different ways manifest and signify that sense which is inborn in us all, and by which we are led to God and to the obedient acknowledgment of His rule. Not only are those who hold this opinion in error and deceived, but also in distorting the idea of true religion they reject it, and little by little. turn aside to naturalism and atheism, as it is called; from which it clearly follows that one who supports those who hold these theories and attempt to realize them, is altogether abandoning the divinely revealed religion. 121 The Old Testament is an indispensable part of Sacred Scripture. Old Covenant has never been revoked. " This is heretical teaching. He has never been pope. He is asserting along with the antipopes that Judaism is a true religion. He denied defined Catholic dogma, he could not do that. "61. The first consideration is that the ceremonies of the Mosaic Law were abrogated by the coming of Christ and that they can no longer be observed without sin after the promulgation of the Gospel." You know, the religion where the founder said blessed be the humble while the current king lives in a palace and makes people kiss his finger when they meet him. Lies, lies, lies that were once upon a time shoved down my throat. Religion is the drug of the people. Catholicism is Adderall. Buddhism is oxycodone. Any religion is a fable, some a bit fancier than others (you probably stopped believing in the tooth fairy before you gave up on Santa Claus, right?) Either way, they are all lies. Libera You know, the religion where the founder said blessed be the humble while the current king lives in a palace and makes people kiss his finger when they meet him. Lies, lies, lies that were once upon a time shoved down my throat. The Catholic Church has created a marvelous book that just barely summarizes all of its teachings and official dogma from 2000 years of debate and refinement in such a beautiful way that renews my faith on the spot. Since I'm familiar with a lot of the topics from extensive research(but know that I'm still very much an amature regarding theology and philosophy), I can honestly say I was even more fascinated how every page resonated with the entire history of theological Christendom b They did it. The Catholic Church has created a marvelous book that just barely summarizes all of its teachings and official dogma from 2000 years of debate and refinement in such a beautiful way that renews my faith on the spot. Since I'm familiar with a lot of the topics from extensive research(but know that I'm still very much an amature regarding theology and philosophy), I can honestly say I was even more fascinated how every page resonated with the entire history of theological Christendom back to the days of the apostles and the writing of the Bible itself. I'm also a sucker for genius and I felt it when I saw a topic that would have taken me 200+ pages to fully articulate be compressed clearly, punctually, beautifully, and concisely in less than 1 page. I think a problem of depreciation could arise from that however. While in this Catechism they do tell the reader the 'why', more often than not they do not give the full reasons 'why' which would entail more than a library of info. The Catholic Church is 2000 years old after all. The purpose of this book was to summarize, and that they did. But every Catholic should realize that, in reading this, you have only begun to know the true form of your faith. You have only read the basics. Included in the book is also the official stances regarding mainly the Eastern Orthodox Church, and the difference between their conception of the trinity and ours,other denominations and faiths, salvation, Mary, the hierarchy or the church, morals, the sacraments, prayer, purgatory, etc. One thing to note when reading this book is that a lot of the topics are spread out. I was kind of surprised as well when Mary popped up for like a page in the first 200 pages and I was like "that's it?" But eventually they get back to her in five or so different sections. The same is with the Eucharist and the hierarchy of the church. It can get kind of frustrating for those that see a claim they disagree/agree with and then for the narrative to switch to something else without a full explanation of the support for that claim, and then the explanation pops up in chunks over the span of 300 pages. But I digress. Ultimately, I went in thinking probably in the back of my mind that "I got this, I know all of it already!" Yeah, no. Some parts and lines were completely new to me and gave me a new dimension to the way I look at my faith. For example, the idea that EVERY sacraments is forever, even those of the priesthood. I honestly assumed that if a priest is defrocked, their 'character' goes away too. But nope. (I knew that the others were forever though) Things like that. Saint Pope John Paul II (Latin: Ioannes Paulus II), born Karol Józef Wojtyła was elected Pope at the Conclave of 16 October 1978, and he took the name of John Paul II. On 22 October, the Lord's Day, he solemnly inaugurated his Petrine ministry as the 263rd successor to the Apostle. His pontificate, one of the longest in the history of the Church, lasted nearly 27 years. Driven by his pastoral solic Saint Pope John Paul II (Latin: Ioannes Paulus II), born Karol Józef Wojtyła was elected Pope at the Conclave of 16 October 1978, and he took the name of John Paul II. On 22 October, the Lord's Day, he solemnly inaugurated his Petrine ministry as the 263rd successor to the Apostle. His pontificate, one of the longest in the history of the Church, lasted nearly 27 years. His love for young people brought him to establish the World Youth Days. The 19 WYDs celebrated during his pontificate brought together millions of young people from all over the world. At the same time his care for the family was expressed in the World Meetings of Families, which he initiated in 1994. John Paul II successfully encouraged dialogue with the Jews and with the representatives of other religions, whom he several times invited to prayer meetings for peace, especially in Assisi. With the Year of the Redemption, the Marian Year and the Year of the Eucharist, he promoted the spiritual renewal of the Church. He gave an extraordinary impetus to Canonizations and Beatifications, focusing on countless examples of holiness as an incentive for the people of our time. He celebrated 147 beatification ceremonies during which he proclaimed 1,338 Blesseds; and 51 canonizations for a total of 482 saints. He made Thérèse of the Child Jesus a Doctor of the Church. He considerably expanded the College of Cardinals, creating 231 Cardinals (plus one in pectore) in 9 consistories. He also called six full meetings of the College of Cardinals. His most important Documents include 14 Encyclicals, 15 Apostolic Exhortations, 11 Apostolic Constitutions, 45 Apostolic Letters. He promulgated the Catechism of the Catholic Church in the light of Tradition as authoritatively interpreted by the Second Vatican Council. He also reformed the Eastern and Western Codes of Canon Law, created new Institutions and reorganized the Roman Curia.